Push yourself towards the ultimate game and buy a TK Synergy S4 hockey stick. When you master this stick you open up new opportunities in the field hockey game. Creating a TK hockey stick review is never easy. The Synergy S4 hockey stick is no exception. TK hockey riddle they’re marketing with mind-boggling acronyms to match their hockey sticks fantastic technology. At least you can take comfort that TK are obviously serious about creating you an amazing stick. Synergy range from TK is designed to offer the good club player great hockey sticks and the Synergy S4 is right in the middle of that range. 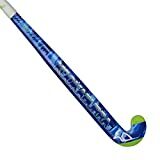 In my opinion it is a great hockey stick giving some advanced features like low bow and a hard hitting feel for a reasonable price. In my Synergy S4 hockey stick review I will try to break down the technology in the stick in to understandable content and relate it to how you might enjoy this technology on the hockey field. CSBR (Carbon Straight Bar Reinforcement) – On the inside of a hockey stick you have carbon bars, they say bars, they could be called rods or walls. The CSBR technology from TK in the Synergy S4 is just a process in manufacturing that lines these bars up perfectly and seals them more rigidly to the outer casing of the hockey stick. What this is designed to achieve is a firmer hit. It would do that by adding rigidity in the shaft. We are talking microelements of force but still, what did I say about commitment. The other side effect is consistency, if you get used to hitting the ball a certain way, with a certain amount of pressure, the CSBR in the Synergy S4 will help the hockey stick make that hit exactly the same time and time again. RLP (Reactive Liquid Polymer) – In the middle of your hockey stick shaft there is a cavity (you should cut your old one open, its quite interesting really) and TK fill this cavity with RLP. RLP in the TK S4 Synergy hockey stick is a resin that has been mixed with microscopic (NANO) particles of carbon fibre. It does the normal job of bonding the out materials together and because it has these nano particles in it makes it tougher. This will reduce the flexibility (again we are talking fractions) of the shaft, making it stiffer and therefore harder hitting and more consistent. SCM (Sheepfoot compression molding)(I kid you not) – Ok if you are childish like me you might think this is a silly name, it is not a silly feature though. Part of the manufacturing process the SCM puts an extra squeeze on the hockey stick while in the mold. This squeeze tightens the weave of fibres and forces out air bubbles. Once again this is really designed to make the mold of the Synergy S4 hockey stick more rigid, stiff and consistent. Well unless you are particularly geeky or a scientist you only really need to know that the Synergy S4 has been lovingly made by TK. If you have an IT department or IT person in your life you will know that they probably speak absolute nonsense most of the time but they make your computer work, so you love them for that. The result of the combination in technology and TK’s obvious love for it makes the Synergy S4 a really stiff, hard-hitting hockey stick. They are adding these technologies to a stick that has 50% carbon fibre, 40% fibreglass and 10% aramid to create the stiffness of a top end stick to one that is a fairer price. Do they achieve it? Well not quite, you can tell the different in power between the TK Synergy S4 and the 90% carbon Platinum P1 Plus when you hit the ball in particular. However it isn’t a bad thing in my opinion, you really need to change your game to move up to one of those high carbon content hockey sticks and the Synergy S4 has most of the feel of a carbon stick, with the give to suit good club players. Shaft bow position is a major factor when considering a hockey stick purchase. Most people these days are trying to get a lower more extreme curve and the TK Synergy S4 is certainly in that mold. With a 25mm curve (the maximum allowed in regulations) at just 220mm up from the floor the Synergy S4 is designed for those budding drag flickers. Combine the bow position with the stiff feel the Synergy S4 makes a great hockey stick for those players looking to advance their game toward the need for an advanced high carbon low bow stick. It is also one of the coolest looking in the Synergy range. The S4 in 2014/15 is available in green or the limited edition orange hockey stick. The TK on the back looks awesome and the elephant, complete with tusks is prominent in the design. In 2015 there is a limited edition Orange version of this stick. As far as I can see the only difference is the colour. Unless you are an orange nut, you can save yourself money going green!